This level has medium difficulty. 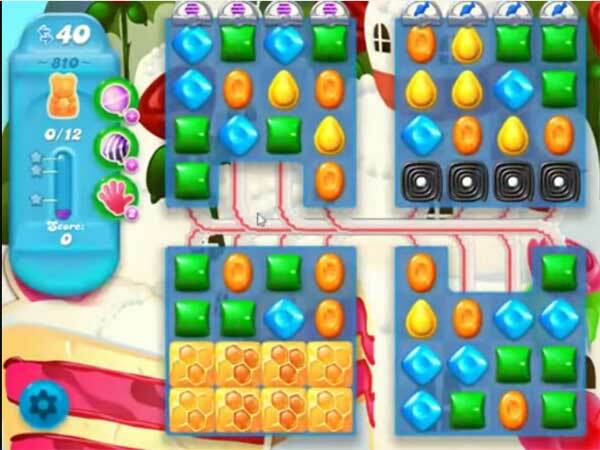 For this level try to play more from bottom part of the board or near to honey blockers to break them. Try to make striped candy and combine with other special candy to break the honey blockers that are in corner to save the bears. Oh my goodness, this is like the most BORING level EVER!!! I don’t care about hard (kinda), but I could only do 3 rounds before I had to quit!! This is gonna take awhile lol. See my posts. I really do hate this 4 boards configuration. Stuck on this level, not fun but must get through it with no boosters since I’m out. 53 tries so far…. The way I see it, if you get a decent board, shouldn’t be a problem. Have gotten about 5 decent boards in 53 tries, but I somehow mess it up at the end. I don’t think I will get through this one, even having some good boards I barely get past the 6 bears although I had ten once, had some hard ones lately but I might just be finishing on 810, too hard for me. This level is impossible. I will be leaving sofa crush. I don’t understand why they make levels this hard. In fact it’s not just hard, it’s nigh on impossible. I am fed up of this now , I have tried at least 200 times with no luck.